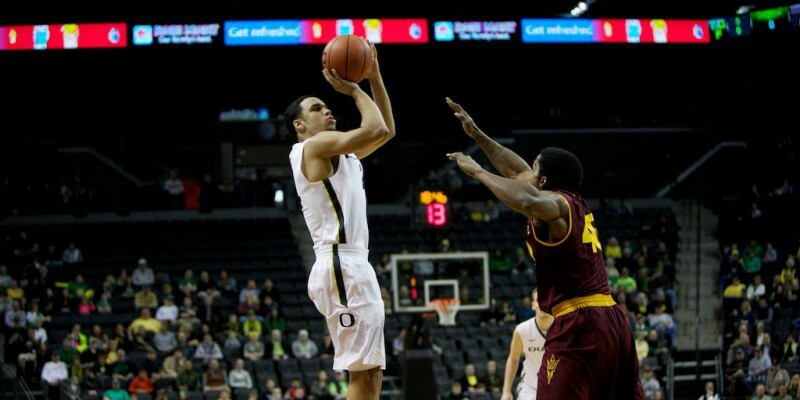 The Oregon Ducks men’s basketball team squared off against the Arizona State Sun Devils in Tempe, Arizona Friday night and came out victorious in a thrilling 68-67 overtime win. Going into Friday night’s matchup, the Sun Devils (11-11, 3-6 Pac-12) had won three out of their previous four games, which included an 18-point victory over the much-improved Oregon State Beavers. The Ducks (15-7, 5-4 Pac-12), however, came in struggling, losing three out of their previous five games. Despite Oregon’s recent struggles, the Ducks started the game well. Elgin Cook and Dillon Brooks combined to score eight out of the Ducks’ first 10 points, and freshman big man Roman Sorkin joined the action as well, by hitting a three pointer midway through the first half. The Ducks’ quick start offensively and their intensity on the defensive end propelled them to an early 19-12 lead. Oregon’s defense, or lack thereof, has been well documented all season long, but the Ducks’ defenders did a great job of locating the Sun Devil’s personnel in the first half, and Arizona State’s shooters had a difficult time getting off clean shots. The Ducks’ stingy defense forced nine turnovers in the first 20 minutes, which led to 15 points off turnovers, but Arizona State kept fighting. The Sun Devils finished the first half on a 9-4 run, and the Ducks’ 10 point lead was cut to five going into halftime. Joe Young’s jump shot with 25 seconds left ultimately propelled the Ducks to victory. The Ducks started the second half with a 34-29 lead, and considering the fact that Joseph Young only scored four points during the first 20 minutes, the men in green and yellow were fortunate to be ahead; however, the Sun Devils came out firing in the second half. They drained four three pointers in the opening minutes and Oregon’s lead quickly vanished. Arizona State used a 14-5 run to take a 40-38 lead. The Sun Devil’s exceptional floor spacing on the offensive end generated many open looks and it kept the game close. Shaquielle McKissic and Tra Holder led the way for Arizona State. The second half of Friday night’s game was very reminiscent of the first time that these two squads faced off. There was a whole lot of back and forth action, and it looked like neither team wanted to take home the victory. The Sun Devils held a one point lead with about three minutes to go, but as Young dribbled down the lane, he spotted a wide open Cook, who uncharacteristically drained a go-ahead three pointer to give the Ducks a 58-56 lead. It was only Cook’s second three pointer of the season. With 15 seconds left in the game, and with a three point lead, Oregon needed one stop to walk away victorious. The Sun Devil’s leading scorer had other plans, though. After failing to get into an offense set, McKissic took control of the ball and knocked down a game tying three pointer, sending the game into overtime. One of the most important aspects of basketball, especially in close games, is free throwing shooting. Despite being on the road, the difference in the overtime period was Oregon’s ability to knock down foul shots. The Ducks connected on all six of their free throw attempts. The hero of the night, however, was none other than the Ducks’ leading scorer. Young’s go ahead jump shot with 25 seconds left gave Oregon a 68-67 lead. The Ducks sealed the victory with a feisty defensive possession. This game was up for grabs, but in the end, Oregon’s resiliency was too much for the Sun Devils. The Ducks must continue to win games if they hope to make a bid for the NCAA Tournament. Oregon will host the Washington Huskies at Matthew Knight Arena next Wednesday night.